Shopping for Twilight Zone Action Figures? 3 3/4-inch scale retro-styled action figures based on The Twilight Zone. 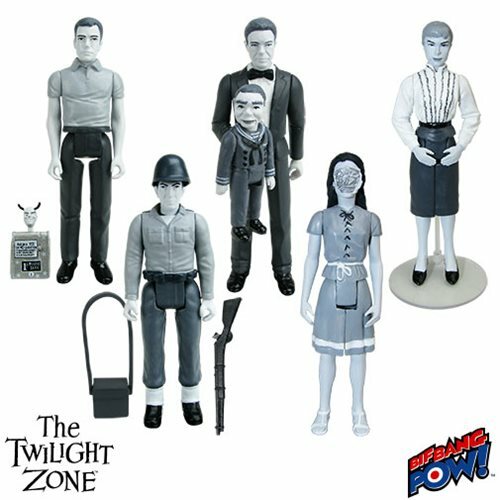 The Twilight Zone action figures you've always wanted! Includes Don Carter, Hansen, Jerry and Willie, Alicia, and Marsha White. Series 4 case includes 8 individually packaged figures. Your favorite characters and creatures from The Twilight Zone have entered our dimension! Bif Bang Pow! brings an incredible assortment of articulated, 3 3/4-inch scale action figures in shades of black and white to your collection. They are individually carded and feature five points of articulation: head, neck, shoulders, and hips. Some of the figures include accessories! Ages 14 and up. Order yours today, and relive your favorite moments from these classic episodes in your own home. "You're traveling through another dimension, a dimension not only of sight and sound, but of mind. A journey into a wondrous land whose boundaries are that of imagination. That's the signpost up ahead. Your next stop... The Twilight Zone." (Spoken by Rod Serling at the beginning of each The Twilight Zone episode. TM & © 2016 A CBS Company. THE TWILIGHT ZONE and TELEVISION CITY and related marks are trademarks of A CBS Company. All Rights Reserved.